Start your job search, find a great career, and apply today. Join one of the fastest growing software companies in the automotive industry. 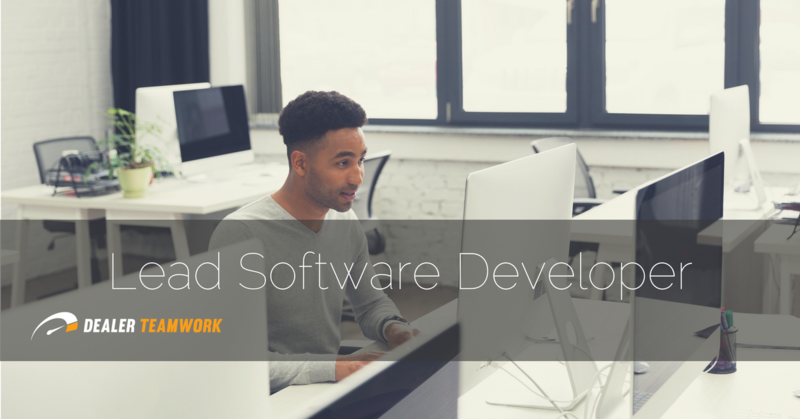 Dealer Teamwork is seeking a talented Lead Developer to provide an immediate impact on a fast-growing technology team. As a Lead, you will collaborate with other leads to architect and implement maintainable, scalable technology solutions. We are looking for an immediate hire to fit our fast-paced, startup culture. You will be working out of our Eden Prairie, MN corporate office. Automotive experience and/or digital marketing experience is a plus, but not required. The ideal candidate has a great attitude and is a self-starter. You should also have the proven ability to problem solve, multi-task and build and maintain relationships. Dealer Teamwork is an equal opportunity employer and a welcoming work environment for people of diverse communities. Please email us at careers@dealerteamwork.com or call us at 855-787-9770 M-F 8:00a – 6:00p CST. Reporting to the Director of Named and Strategic Accounts and serving as an integral member of the Dealer Teamwork team, the Account Executive will be responsible for managing an assigned portfolio of named or OEM clients. 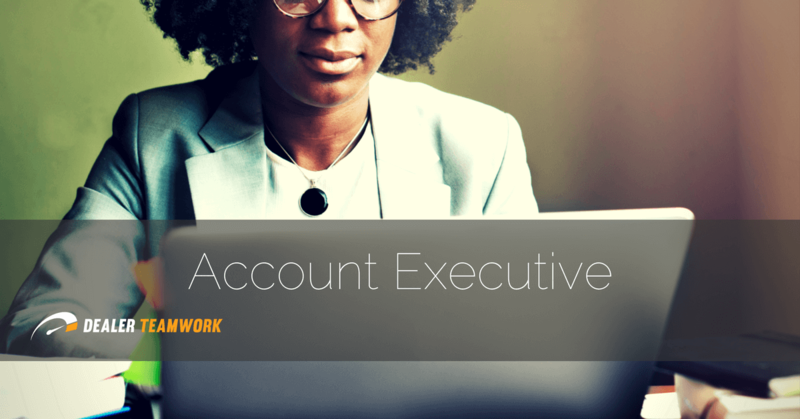 The Account Executive will build relationships with clients over the phone, through email correspondence and may be requested to meet in person. They will be in charge of building and maintaining accounts within the Dealer Teamwork system. The ideal candidate has a great attitude, is a self-starter and has the proven ability to problem solve and multi-task. Must have proven experience with presentations. Digital and Automotive Experience are also a plus. The ideal candidate for this position will have the experience/skills listed in this job description PLUS a flexible, hardworking approach with no hesitation to take on tasks outside the specific scope of the job description. We are a start-up so this individual should be able to work independently or with a team and effectively execute objectives with minimal management. The Account Manager will be expected to exceed performance goals by constantly innovating and improving the existing account manager functions. It is very important that this person is someone who will bring a high level of customer service skills, intellect, creativity, and problem-solving skills to constantly work towards evolving the way our company operates! Build new accounts and ensure all contractual commitments are fulfilled. Perform all aspects of account management including product setup and training. Work with clients to ensure they are using their full suite of products monthly. Present reporting to clients monthly, making changes to accounts as necessary. Maintain a high level of customer service for our clients. 5+ years of Account Management or similar experience. Automotive experience or similar experience. Digital, and/or marketing experience is a plus. Customer service oriented with excellent verbal and written communication skills. Must have the ability to manage multiple priorities in a fast-paced environment and respond to urgent requests when necessary. Please email us at careers@dealerteamwork.com or call us at 855-787-9770 M-F 8:00a – 6:00pp CST. Reporting to the Director of Account Management and serving as an integral member of the Dealer Teamwork team, the Account Manager will be responsible for managing an assigned portfolio of clients. The Account Manager will build relationships with clients over the phone and through email correspondence and will be in charge of building and maintaining accounts within the Dealer Teamwork system. The ideal candidate has a great attitude, is a self-starter and has the proven ability to problem solve and multi-task. 2+ years of Account Management or similar experience. Automotive, digital, and/or marketing experience is a plus.